I have had a number of concerned parents contact me and bring their children to see me regarding food intolerance. One little boy, James 2 ½ years, came to see me with his mum who wanted to know about foods and asthma. James was a healthy weight for his height with no other issues other than quite severe asthma. Mum was convinced that every time they had a barbecue his breathing became 'wheezier'. I discussed the probability that he may be reacting to a certain preservative found in foods such as sausages and processed meats. The preservatives in question are those numbered 220 – 228 or the family of sulphites. They are also commonly found in dried fruits, cordials and wine(for adults). There is no documented evidence that this is the cause for asthma attacks however many people report a change in breathing when they consume them. I suggested buying preservative free sausages and dried fruit for James and avoid giving him cordials. Sulphites are easy to locate just read the label. 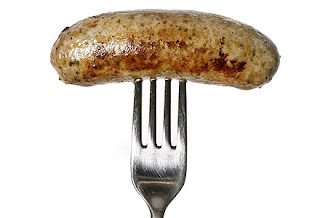 I am curious we buy our sausages from the local butcher who is known for the best sausages and they are not fatty as they often stick to the pan...would these contain sulphites? I get terrible migrains from wines that contain the preservative 220 but not the wines that contain preservative 224?